A geographer by profession, Tomasz Padlo is also a photographer with an eye for capturing unusual sights and spaces. His body of work Greetings from Kazakhstan – a visually delectable collection of images of the picturesque sheets that cover building sites – has just earned him a place in the shortlist of this year’s Sony World Photography Awards. On the phone from his home in Poland, the photographer is explaining how he wanted to convey an element of magical realism through the work; he says he was intrigued by the dissonance between the idyllic landscapes and the reality, since the city of Almaty where he captured the images is in fact “one of the most polluted cities in the world”. Padlo came across the sheets while he was in Kazakhstan attending an exhibition in the capital city of Astana. He had time to kill and so made the long journey to Almaty in the south where he wandered around with his camera. The Kazakhstan we know best comes from popular culture – specifically the character of Borat as portrayed by Sacha Baron Cohen – but it is a fascinating country in its own right, says Padlo. Bordered by Russia and China, it is the largest country in Central Asia and the ninth largest in the world. It gained independence from the Soviet Union in 1991, and authorities in Kazakhstan have been trying to change the country’s negative image by promoting its natural attractions. Kazakhstan’s environment was severely damaged during Soviet times due to nuclear testing and other kinds of contamination, explains Padlo. 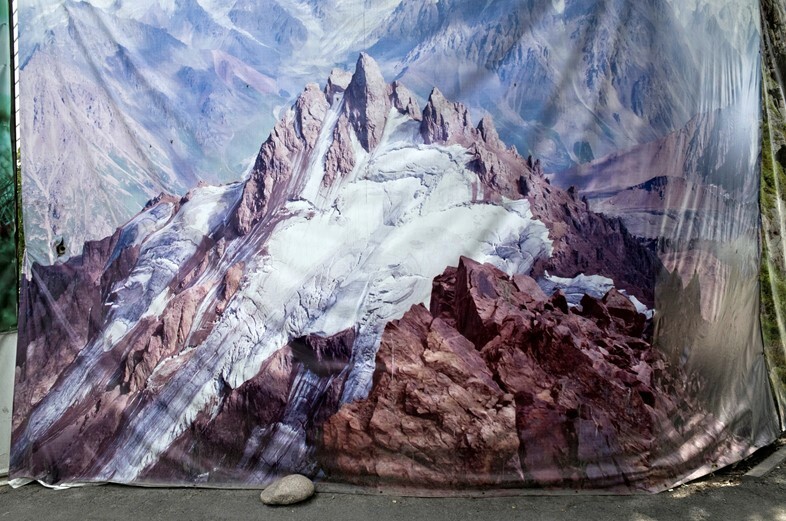 Once he’d noticed the backdrops in Almaty, he couldn’t help but photograph them. 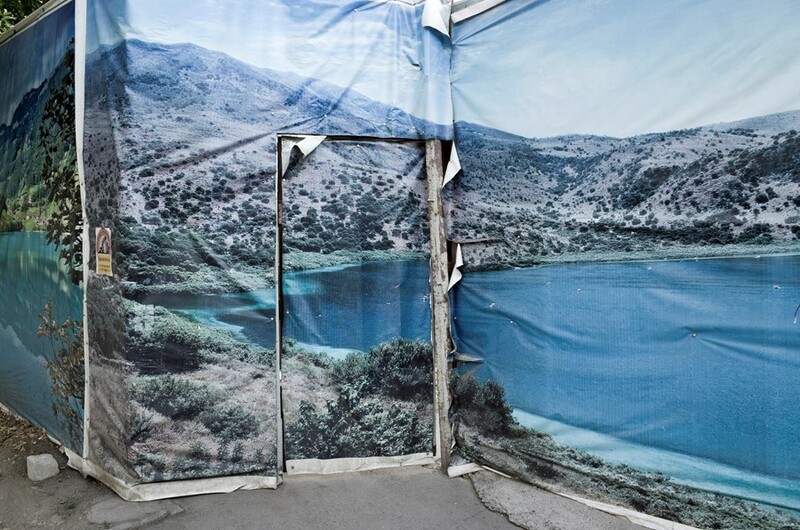 The photographer is interested in making pictures about perception, and keen to find ways to connect human geography and photography, so the way these sheets seemed to become integrated into the city was of endless facination to him. Even just to glance at, many of these artificial landscapes are a sight for sore eyes. There is Lake Kapchagay to the north of Almaty, the Tian Shan mountain range, and Borovoe lake, around 200 km north of Astana, to mention just a few. They appear like shimmering mirages in an urban desert, the backdrops portals to places that seem to be just out of reach. “Kazakhstan is growing fast as a result of investment, and is trying to leave behind this negative stereotype by building a new look,” says Padlo. 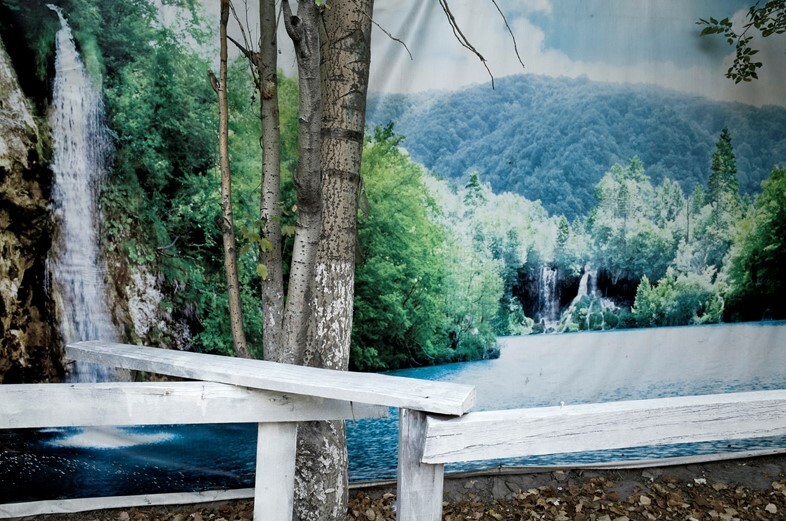 “A way to change opinion is to promote tourist attractions, but Almaty is the last place to promote such beautiful landscapes because everything is polluted and dusty.” And yet, he concluded, these “crumpled, dirty sheets say more about the country than the originators could have predicted”.